An amazing discovery in Southeast Colorado suggests that ancient America could have been visited by a culture with roots in Asia. Rock carvings and other evidence are presented here for public scrutiny the first time. Your comments and discussion are welcome. The land around Southeast Colorado is arid, supporting cactus and tall grass. It is used today for cattle grazing and is sparsely populated. In the past, this area was known as "the Sea of Grass" because, prior to the introduction of the horse by the Spanish, the Native people had great difficulty navigating the hills and valleys that were covered with tall, thick grass. That same grass is kept short now by thousands of cattle that graze the area. The Native people were able to navigate the many canyons and rivers in this area, as is evidenced by their artifacts and carvings found here, but the area was, and still is, largely unexplored and uninhabited. 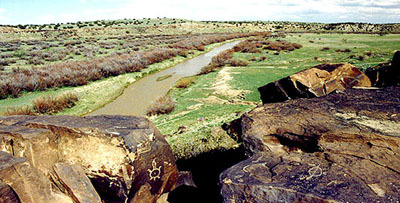 The isolation of this area has preserved a unique and mysterious collection of rock writing -- called petroglyphs -- that can be found mingled with the familiar scrapings and art of the Plains Indians. Not many know it exists and still fewer are able to understand the significance of what appears to be an ancient system of writing. Viewzone Magazine was asked to investigate this phenomenon and to publicize the data on the internet. It is hoped that some scholars of archaic languages might be able to shed some light on the origins of these odd symbols. 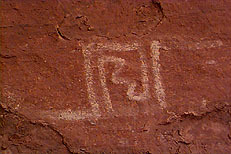 And so, in the summer of 1998, Viewzone took a team to Colorado and photographed the petroglyphs with a high-resolution digital camera. Some of these images are presented here. We initially planned to visit only this one archaeological site in Colorado. To gain some quick education in American rock art we headed to one of the oldest inhabited areas of the Southwest, where the great and mysterious Anasazi ("ancient competitor"). See beginning of this expedition for our exploration of both the Hopi and Anasazi ruins. Here's what we learned from the "Four Corners" area: We noticed that Arizona's petroglyphs were sparse and isolated, almost hidden. Most always they were small animals with horns - goats or sheep - and were interpreted as Anasazi clan marks. 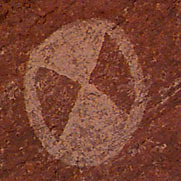 In fact, we saw more pictographs, or painted images, on the ancient dwelling walls than we saw petroglyphs. The interpretation of the other symbols is pretty well understood and is believed to have been a sort of "universal" inter-tribal language based on hand signs. At least this is the highly regarded effort of LaVan Martineau. Martineau was adopted by a Native American family as a youth, exposed to the science of cryptography in the military, and he applied his unique talents to decipher the signs and symbols of the "universal" Indian language as it appeared on the rocks throughout America. His translations have opened up a view of Native American history from a perspective uncommon to most white history books. "Holding war... gone to the main city..." - An attempt at a translation using Martineau's technique. Most Native People's language was not written, only spoken. When two tribes with different dialects met, they often communicated with hand signs, and this practice is still sometimes used today. Martineau's ability to recognize graphic representations of these hand movements allowed him to inspire historians and archaeologists all over the West. We would strongly recommend his book, The Rocks Begin To Speak (Library of Congress Number 72-85137). We revisited the symbols in Mystery Canyon (above) and noted that Martineau's translation would have had the two arrowheads interpreted as "conflict" or "war" while the circle would mean "holding" - "holding war?" Was this the last painted message left by the Anasazi before they disappeared into the shadows of history? In some of their most remote habitats there was still grain and remnants of basketry, left abruptly. To the right is a stepped figure that begins with a horizontal line. The line looks like "trail" while Martineau seems to suggest the steps mean "temple or heaped-up place" - some important place (note the similarity to the faded symbol in the Hopi Sun Park). Perhaps this was a message that they were leaving to assemble at some obvious center before going to war? Or had war forced them to travel to a more fortified area? We're just guessing. But that's the way it works when you have no writing and mere symbols.